Northern Images is pleased to host the 56th Annual Cape Dorset Print Collection. These coveted prints are released across the country once annually, Northern Images has been proud to participate in this release for over 40 years. Your lunch break is meant to be a break. It’s not for checking your email, paying bills, or fighting against traffic. This October, the Yellowknife Public Library challenges you to take time for yourself on your lunch break. Escape from the noise and distractions, get away from the daily grind. Join in at the Silent Reading Café. The Yellowknife International Film Festival (YKIFF) is hosted by Western Arctic Moving Pictures (WAMP), in the capital city of Canada's Northwest Territories. YKIFF showcases film and new media works from all over the Canadian and Circumpolar North with selected international works. Come celebrate “Sahtu In the Arts” during Arts Week; an opportunity to celebrate and engage in the Arts. 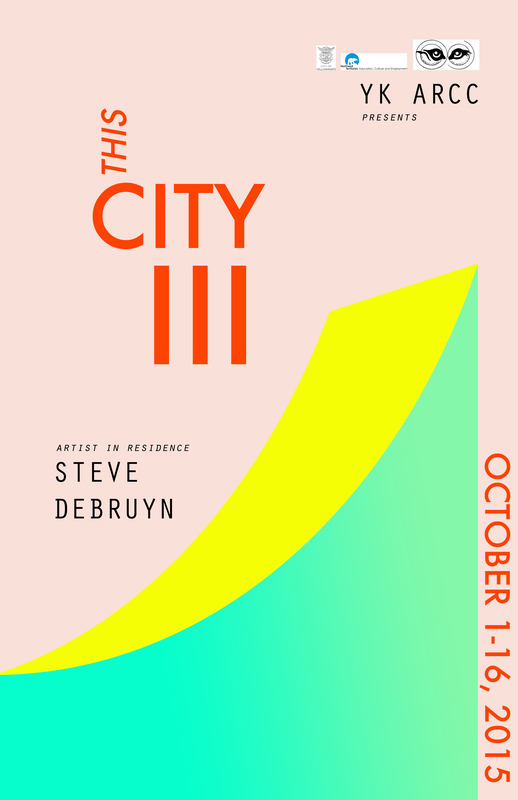 The YK ARCC is pleased to announce Steve deBruyn as the artist in residence for ‘This City III’. During his time in Yellowknife, the London Ontario based artist will focus on Yellowknife’s unoccupied spaces, re-purposing found materials, and engaging with the local community to create site-specific installations. FORT MCPHERSON (August 28, 2015) – A group of 13 crew and two cast members will travel to Fort McPherson next week to shoot The Sun at Midnight, a feature film by NWT writer and director Kirsten Carthew and NWT producer Amos Scott, of Jill and Jackfish Productions. The film features a nearly exclusive northern cast and crew. I.C.A Publishing is accepting submissions for the 11th volume of International Contemporary Artists. Each volume is an overview of contemporary world art production that enables the viewer to acquire a global and multicultural perspective and attention into different artistic expressions. Porcupine quillwork may be fading in popularity as an art form in the NWT but a woman from Fort Good Hope is doing everything she can to keep it alive. Lucy Ann Yakeleya demonstrates how to use porcupine quills to create art. The Fort Good Hope woman was the traditional artist in residence at the Prince of Wales Northern Heritage Centre in Yellowknife last week. performing at the Pan-Am Games (Toronto) and Great Northern Arts Festival (Inuvik). While in Toronto, the Tuktoyaktuk Siglit Drummers and Dancers will perform as part of the Opening Ceremonies for the Aboriginal Pavilion (located at the Fort York National Historic Site’s Garrison Common) on July 16 at 7:00 pm and at the Ontario Celebration Zone at the Harbourfront Centre on July 18 at 3:00 pm. IRC is pleased to invite world-renowned Inuvialuit master artist Abraham Anghik Ruben to the Great Northern Arts Festival (GNAF) in Inuvik July 17 to 26. Powerful, compelling and exquisite are a few of the words to describe the work of Abraham. In his hands, traditional Inuit subject matter have become contemporary sculptures. “I have always tried to learn from others, either Inuit or other elderly people who can pass on their knowledge of what life is about. I try to put that into my sculpture,” reflected Abraham. SSNAP is pleased to congratulate Yellowknife artist Patricia Slighte for becoming a finalists in The Salt Spring National Art Prize. Jill & Jackfish Productions is looking for NWT residents to crew the feature film “The Sun At Midnight”. Dates: mid-August to early September. Positions are paid, and some roles do not require experience and include a mentorship component. Discover how award-winning paleoartist Julius T. Csotonyi draws on his scientific background to reconstruct ancient worlds through illustration. The presentation features ice age mammals, dinosaurs and ancient landscapes. Thursday, June 18, 7pm is the official opening of Prince of Wale Northern Heritage Centre's (PWNHC) new exhibit “Ice Age Bison Discovery: Our Frozen Past and Thawing Future”. On display: a 13,650-year-old steppe bison skull found in Tsiigehtchic, NWT in 2007. Go check it out! Drawing Inspiration from Canadian artists such as Tom Thompson and the ‘Famous Group of Seven’ we will venture into the wilds around Yellowknife to capture the sub arctic terrain with our drawing tools and paint. Call for PARTICIPATING ARTISTS for the Contemporary Inuit Art Collection Imago Mundi Project, FONDAZIONE BENETTON STUDI E RICERCHE, Treviso, Italy in collaboration the Inuit Art Foundation.